Though frequently linked to the “riot grrrls” scene, S-K quickly and seemingly easily transcended the limits of that subgenre. The best Sleater-Kinney material is wild and timeless rock ’n’ roll with brawn and brains. I’ve missed the band. I was hopeful at first, because the breakup was initially announced as a “hiatus.” Then, as I realized the hiatus was appearing to be more and more permanent, I feared the group might be using such weasel language in preparation for careers as political campaign flaks. Sleater-Kinney isn’t doing a reunion. But the new band Wild Flag could be considered two-thirds of one. 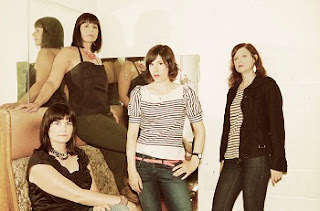 Guitarist/singer Carrie Brownstein and drummer Janet Weiss from the original band are together again. But wait, as the late-night TV ads say, there’s more! This band also includes singer/guitarist Mary Timony, who fronted a 1990s indie band called Helium. (Reviewing Helium’s album The Dirt of Luck back in 1995, I wrote, “Like the band name implies, this is light, bouncy music. And yet it’s got a powerful undertow.” I’ll stand by that.) Timony and Brownstein have worked together on various projects through the years, and it shows on this album. I’m not familiar with the life and career of the fourth Flag, keyboard player Rebecca Cole. But who cares? She was in a band called The Minders. She adds a lot to Wild Flag’s self-named first album. Wild Flag starts off with a big bang — an upbeat, catchy tune called “Romance.” Brownstein sings it like she’s excited to be there, and the rest of the group complies. Things slow down a little bit for Timony’s “Something Came Over Me.” But Wild Flag comes back with a fierce little Brownstein rocker appropriately called “Boom.” It’s colored by Cole’s garagey organ. And this is followed by one of the album’s high points, “Glass Tambourine,” a Timony song that starts off slow and sturdy but explodes with psychedelia and echoes of New Wave goofery. It’s five and a half minutes long, and these gals jam shamelessly and gloriously on it. But even better is “Racehorse.” The song starts out with guitar riffs that sound almost bluesy. “I’m a race horse, yeah, I’m a race horse,” Brownstein sings. It sounds like lines from some old forgotten blues tune from the 1930s. And again the jamming commences, Brownstein and Timony on guitars, Cole on electric piano (and later organ). This isn’t the rebirth of Sleater-Kinney. But it’s definitely some of the most satisfying rock ’n’ roll you’ll hear this year. 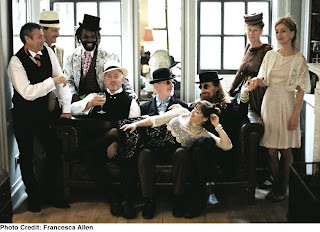 Ancient & Modern, subtitled 1911-2011, is a strange concept album dealing with the Edwardian period (did I mention the Mekons are British?) in the years leading up to the beginning of World War I. It’s a world that’s about to change for the worse. It took me a couple of listens to start appreciating this album. It’s the Mekons, so I figured the effort was probably worth it. My first reaction was that it was too slow, with only a couple of real rockers (“Space in Your Face” and “Honey Bear”). But soon the charms of Ancient & Modern started sinking in — the off-kilter blues of “Calling All Demons,” which Jon Langford sings in a strained falsetto; the sad dreaminess of “I Fall Asleep,” which Tom Greenhalgh sings like a cracked hymn (“I fall asleep when I should pray”), first over a simple piano, and later joined by Sally Timms’ vocal harmonies and Susie Honeyman’s sweet violin. But the real treat here is Timms’ minor-key music-hall blues “Geeshie.” (Langford has said that the melody of this came from a song called “Last Kind Words,” by an obscure Mississippi blues queen named Geeshie Wiley.) Timms sings it sultry, like a temptress in a speakeasy near the gates of hell. Once again, the Mekons have me sold. This album is set for release Tuesday, Sept. 27.